Say what you will about Gameloft, the developer occasionally does a good job of filling the App Store void with iOS versions of console staples. N.O.V.A. 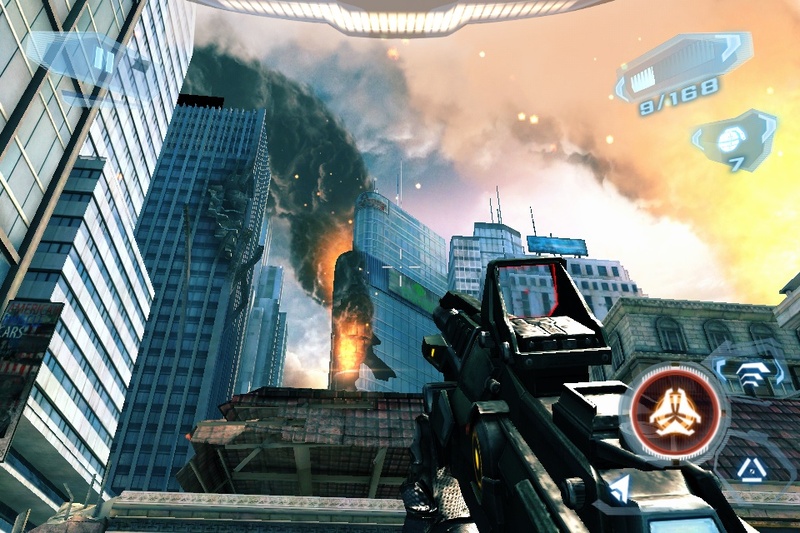 3 ($6.99), the third game in the company’s perennial FPS series is one such title. Capitalizing on the success of the previous two titles, as well as offering full support for the latest and greatest in Apple hardware, N.O.V.A. 3 offers a great action-packed single player experience complete with some very impressive visuals. Following the never-ending trials and tribulations of Kal Warden, N.O.V.A. 3 continues the story as Warden is yet again recalled into action, this time to the ruins of San Francisco to aid an old friend. From there, you’ll travel to several more planets, a derelict ship, and even the home planet of the Volterites. I’ll save the spoilers for those of you that care about the story, but suffice to Kal gets tasked with saving the human race (again) from certain doom and will go through humans, Volterites and Judgers alike to accomplish that feat. You’ll be saving humanity via gameplay that should be largely familiar for genre veterans. Like its predecessor, N.O.V.A. 3 has you exploring a wide variety of locales while battling enemy archetypes and hitting objective-marker based goals that shouldn’t offer much in terms of surprise. Also, you can expect the occasional break from the on-foot battle heroics by piloting Mechs, manning the weaponry on top of AI driven trucks and serving as sniper support for other NPCs. 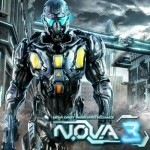 By now, it should be apparent that Gameloft has uncovered the formula for a successful FPS, and while N.O.V.A. 3 doesn’t offer much in terms of revolutionary gameplay, it certainly succeeds in what it does implement. One interesting inclusion is an in-game store that offers unique weapons and upgrades that takes currency you earn by completing single player levels. It’s nice to see a system that actually provides rewards proportionally to how well you complete a level run. Unfortunately, the inclusion of IAP to bypass said currency collection lessens experience somewhat. A well-done FPS is in some ways far more reliant on its controls than other genres. Thankfully, N.O.V.A. 3 works within its limitations to provide a competent scheme for a touch screen. 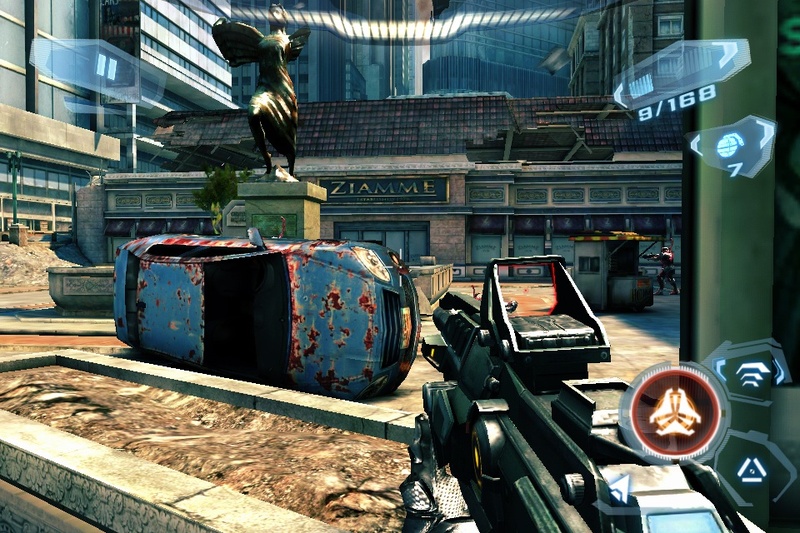 The standard dual-stick controls are available, as well as generous use of a swipe gestures for swapping weapons and powers. I was particularly a fan of the gyroscope inclusion, as proper use of that option goes a long way towards making the game’s aiming accurate and fun. N.O.V.A. 3 plays well on the iPhone, but I found the screen to be a bit cramped compared to the roomy iPad controls. Either way, a host of options such as auto-aim, attempt to help even touch-screen novices blast away with ease. While I imagine there are some folks that will never get used to touchscreen controls for an FPS, the fact remains that N.O.V.A. 3’s control schemes do a decent job of letting you take out baddies and navigate the environments with ease. By the way, those environments you’ll be traversing across look absolutely gorgeous. N.O.V.A. 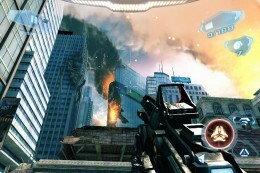 3 takes full advantage of the hardware offerings of the iPhone 4S and new iPad, which leads to one of the most visually impressive FPS titles I’ve played on iOS. The textures, weather and visual effects – even the shadows are all well done and simply stunning. As nice as the game looks on the small scree, N.O.V.A. 3 begs to be played on a new iPad. The larger retina-display of the tablet lets you truly appreciate just how far the visuals have come in the series. The fact that the game manages to look this good while successfully running (for the most part) at a decent framerate is probably the most impressive accomplishment. Granted, there were a few mishaps with the graphics engine, such as a few instances of falling through environments, the occasional slowdown when there’s a lot of action on the screen and the unusually lengthy loading screens (that occasionally make you think the game crashed), but these do little to detract from what is an otherwise impressive visual system. It would be easy to simply classify N.O.V.A. 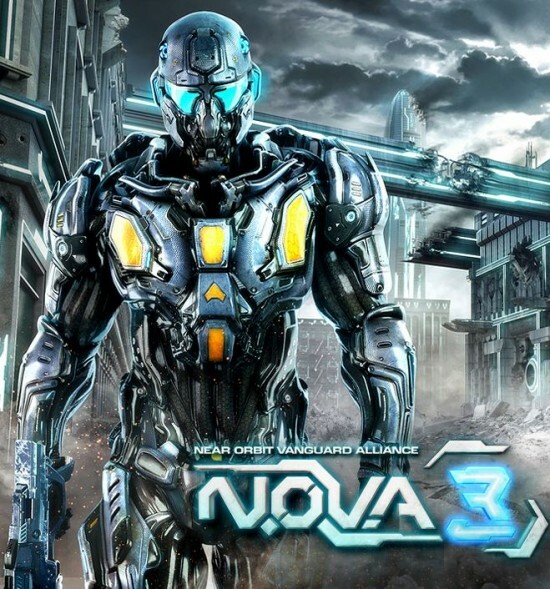 3 as impressive eye candy and leave it at that, but Gameloft deserves credit for continuing the trend of creating a well-rounded FPS experience complete with a full story-driven campaign, a plethora of control and gameplay options and a balanced gameplay experience. We sometimes talk about games that possess that certain something that make them ideal for showcasing the might of iOS. I’d argue that, while N.O.V.A. 3 may not necessarily be at the top of that shortlist, it has enough going for it to warrant being close to such a classification. This is part one of our two-part N.O.V.A. 3 review. In previous N.O.V.A. games, multiplayer played a very large component of how much our community enjoyed the game. With our early review copy, there obviously wasn’t anyone to be found to play with online. As soon as the game is released, and we can spend some quality time with the multiplayer we’ll post a follow-up focusing on the multiplayer aspects of N.O.V.A. 3.